My love of reading precedes my love of cooking. I spent my primary school years devouring the books of Enid Blyton, I was fortunate to be able to go home for lunch and after eating my lunch I would lie on my bed for half an hour reading before heading back to school. I seem to have much less time to read novels these days, but always have at least one book on the go, usually manage a couple of chapters before I go to sleep at night. I also like to have books on my tablet, that I can read when I'm travelling, so can be reading more than one book at a time. I've been fortunate that, through reviewing cookbooks, publishers have also offered me some novels to read and review. So every now and then you will find my first love creeping into my kitchen to claim a little spot here where I can share with you the books I am reading. Justine is running for her life. Escaping a city and a man, who, between them, have almost broken her. She heads north to the mountains and the valleys of the Highlands, looking for somewhere to hide. Michael and Hannah are also running. With their two sons and their tattered marriage they have come to the village of Kilmacarra. They are looking for somewhere they can call home. In a place of standing stones, an ancient landscape in a country on the brink of change, a brutal accident causes their lives to intertwine. Tangled together in threads of guilt and love, with Scotland rushing towards a referendum and the community around them fracturing, each must question where they truly belong. 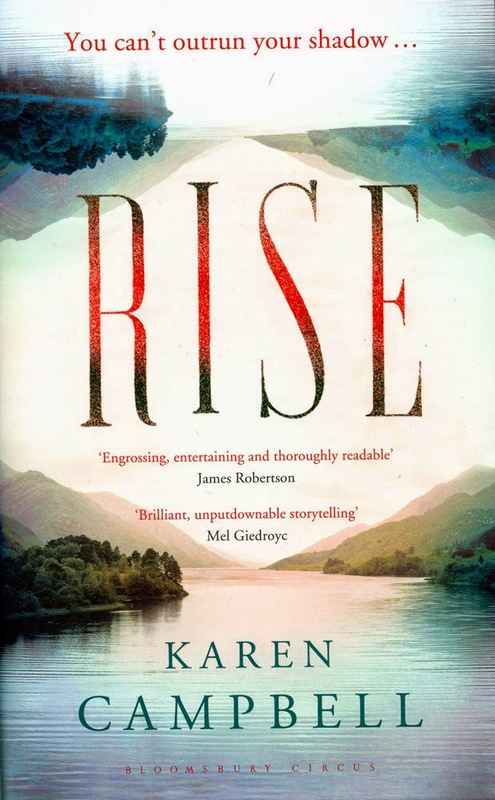 Tackling contemporary questions of nationhood and identity through the issue of Scottish Independence and the debates surrounding sustainable energy, Rise is an important and powerful story of living in the modern world. I reviewed Karen Campbell's previous novel, This is Where I Am which, although challenging, I really enjoyed. I found Rise even more challenging, Michael and Hannah's unhappiness and the underlying threat and menace to Justine were disturbing, and as I neared the end of the book I had to force myself to continue reading. I think the blurb over estimates the impact of the referendum on the plot, it could have as easily been set around a council election and I was only aware of any issues of 'nationhood' through the discussions Michael had with his political mentor, John Donald. More significant were the environmental and local activist messages and the exploration of mental health and marital breakdown. This isn't a thriller, but it had a similar impact on me as a psychological thrillers which I generally avoid. I carry away a little of every story with me after reading and found myself having several nights of disturbed sleep after reading Rise. There were many good things in this book, not least the portrayal of Scottish village life, and the characters you might find there. However, I found that the the lack of honesty amongst the characters combined with the latent terror, violence and sadness in this book, made it a book I found hard to enjoy. If you are made of sterner stuff, then there is no doubt it is a well written novel with recognisable characters and situations, it just wasn't for me. And now to introduce to you a writer you may know in a different guise. Rachel Cotterill is talented writer who combines her love of cooking, and photography on her blog 'Rachel Cotterill'. In her 'spare time' Rachel is a computational linguistics PhD student, writes and publishes fantasy novels and I thought I was busy! When a stranger tells her she's a mage, Ailith is intrigued but she's also afraid. Magic is heresy, and heresy means death under the Temple Law. Even literacy is suspect in a girl of her background, and her sister's impending wedding only serves as a reminder that she should be focusing on her future. Then a local priest asks her to rescue his son, and she starts to wonder if her talents could be a blessing, after all. The Lord Baron of Watersmeet, Leofwin isn't accustomed to welcoming uninvited visitors. A commoner turning up at his gates should be no more than a minor footnote to his day, but something about Ailith catches his attention. 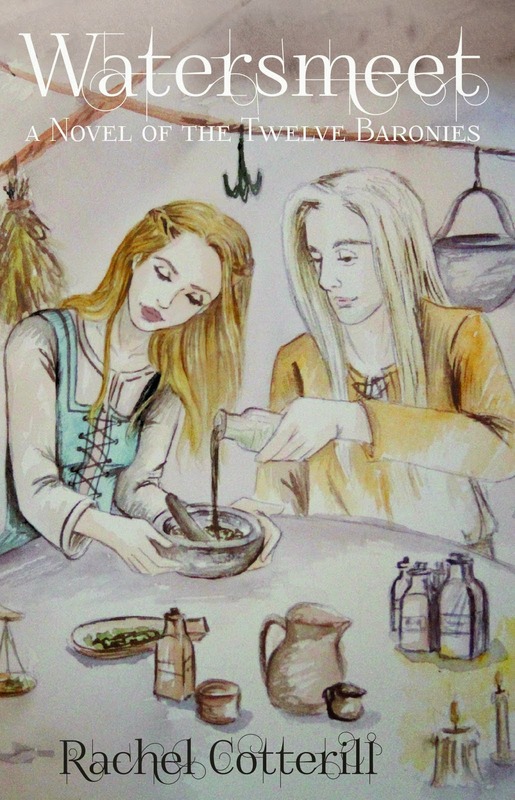 Alchemy can be lonely work and an apprentice might be just what he needs.As their lessons grow into shared experiments, Leofwin wonders if he might even trust her with his greatest challenge. But Ailith can't forget why she came to the castle. I've read a couple of self published books before and have been disappointed, but this novel did not disappoint. There is quite a bit of scene setting in the first few chapters, but once Ailith reaches Watersmeet, the pace quickens and I couldn't put this book down, I just wanted to find out what was going to happen next. It's a love story, an adventure, a story of betrayal and, of course, magic! The characters are fully rounded and complex and I can see that some of those lurking round the edges of this story may come to the fore in future novels. Once I had finished Watersmeet, I immediately wanted to read more of the Twelve Baronies Novels, alas they have not yet been written. However, Rachel has written a short prequel The Falconer which you can download for FREE from Smashwords to see if you are as taken with Rachel's writing as I was..
Ooh how exciting Janice. I've been wanting to read one of Rachel's books, but just can't find time to read these days. Sounds like my sort of book.